Thousands of fans headed to movie theaters across the country for the April 24 showing of "The Countdown," Drum Corps International's spring cinematic event. As part of post-event activities, fans have been logging onto DCI.org to rank and rate the six corps performances they witnessed on the big screen Thursday evening, using a modified version of the actual judging process used to evaluate the world's most elite and exclusive marching music ensembles on the field each summer. 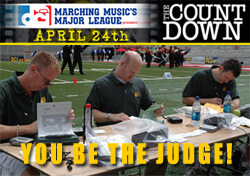 "Countdown" fan judging on DCI.org will run through Saturday, April 26 at noon ET. Scores will then be tabulated and averaged, with the highest scoring group earning the title of "2008 Countdown Champion." Fan-judged "Caption Award winners" also will be recognized for achievement in brass, percussion and color guard performance. In addition to the announcement of fan judging results, DCI.org Web watchers will have the opportunity to take an exclusive look inside the upcoming weekend rehearsal camp of the Phantom Regiment. The corps' brass and battery percussion section members meet up this weekend in Beloit, Wis. to continue their off-season training, prior to their June departure for the annual DCI Summer Tour. Originally scheduled to be broadcast following the completion of judging on Saturday, April 26, the "Countdown" results Webcast video will instead be posted Sunday afternoon, allowing camera crews to capture the brass and battery percussions sections during their ensemble rehearsals Saturday night, providing fans with the opportunity to go behind the scenes with the Phantom Regiment. Which corps will earn bragging rights as the "2008 Countdown Champion"? Stay tuned to DCI.org this Sunday to find out. Be a "Countdown" judge now.